King of the Cage is one of the most well-known mixed martial arts promotions on the planet. 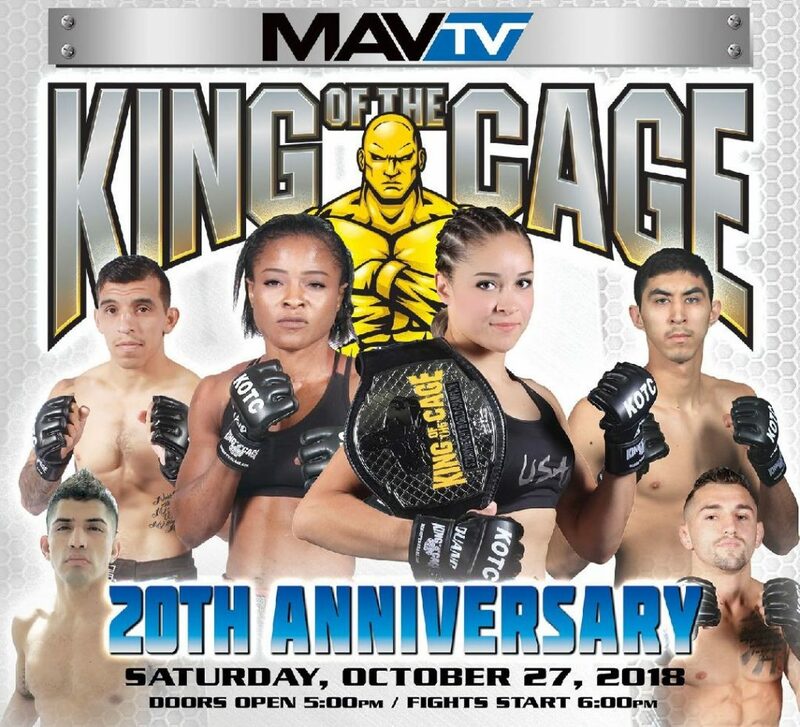 KOTC was founded in 1998 by Terry Trebilcock and featured mostly amateur as well as up and coming MMA stars and former mainstream combat fighters. King of the Cage has been a career staple for countless stars including Ronda Rousey, Forrest Griffin, Quinton Rampage Jackson, Daniel Cormier, TJ Dillishaw, Demetrious Johnson, Robbie Lawler, Rory MacDonald, Rashad Evans, Krazy Horse, Keith Jardine, Mac Danzig, Urijah Faber, Joe Stevenson, and Diego Sanchez. The company has promoted more than 500 events since inception. The organization promoted a majority of its events at Native American casinos throughout the United States but also promotes events in Canada, Australia and Japan. King of The Cage events are also broadcast on most national pay-per-view platforms. 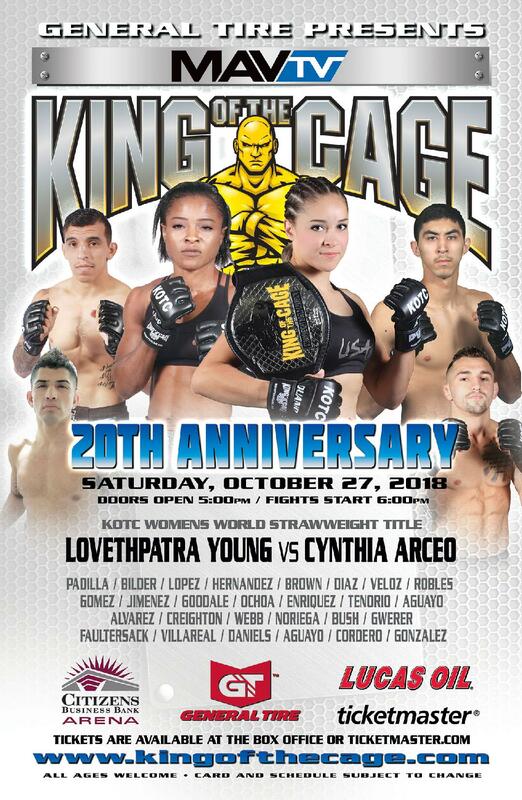 King of the Cage returns to Citizens Business Bank Arena in Ontario, California on Saturday, October 27, 2018 with a nationally broadcast event headlined by a Women’s Strawweight World Title fight between current KOTC champion, Cynthia Arceo vs. Lovethpatra Young. The co-main events will feature a Lightweight showdown between Jason Cordero vs. Fernando Padilla and Albert Veloz vs. Mauricio Diaz in a bantamweight bout. Cynthia “Sin” Arceo (4-0-1), El Paso, Texas (United Shotokon Association Karate) vs. Lovethpatra Young, Los Angeles, California (Nubians MMA). Arceo, who is undefeated in her professional career, is one of the top ranked women’s fighter pound for pound. Young, who was undefeated in her amateur career, is also top ranked. This is a rematch of their last fight that ended in a draw due to injury. Jason Cordero, Hawthorne, California (South Bay Jiu-Jitsu) vs. Fernando Padilla, Juarez, Chihuahua (Team Oyama). Padilla, who has seven wins, is ranked in the top 10 in Lightweight division. Cordero is an experienced fighter with five wins. Albert Veloz, Victorville, California (Cage Combat Academy) vs. Mauricio “The Shark” Diaz, Anaheim, California (Master Toddy). Veloz is undefeated in his professional career and Diaz has three professional wins.